Dustin Johnson chats with a rules official on the fifth green during the final round of the 2016 U.S. Open at Oakmont Country Club. Johnson may be assessed a one-stroke penalty after his round. UPDATE, 8:17 P.M.: Following Dustin Johnson's final round of the U.S. Open, the USGA announced it was penalizing Johnson one stroke for the incident on the 5th green. Johnson's score on the fifth hole was changed from a par 4 to a bogey 5. After the penalty, his final-round score was a one-under 69, which gave him a three-stroke win over Jim Furyk, Scott Piercy and Shane Lowry. UPDATE, 7:44 P.M.: Sports Illustrated’s Alan Shipnuck talked with USGA executive director Mike Davis, who told Shipnuck that a four-person rules committee will decide if Johnson should be penalized. "Our best people on the rules," Davis said. … Davis added: "People are going to be upset however we rule. Bottom line, we have to follow the rules no matter what." UPDATE, 6:30 P.M.: Fox Sports analyst Curtis Strange reported that the rest of the field was notified of Johnson's potential rules infraction. The USGA said they felt it was important to keep the field informed. OAKMONT, Pa. -- Dustin Johnson might be assessed a one-shot penalty following the final round of the 2016 U.S. Open at Oakmont. The infraction in question occurred while Johnson addressed a putt on the par-4 5th hole. Just before Johnson made the stroke, he backed away from his ball when he noticed that it had moved. 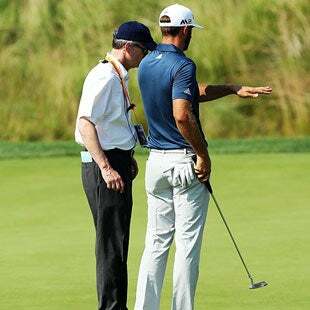 He immediately alerted a rules official. At the time, the official decided to not assess a one-stroke penalty, accepting Johnson's claim that he did not cause the ball to move because he hadn't grounded his club before the putt. Seven holes later, on the 12th tee, officials notified Johnson that they had reviewed the video footage of the hole in question, and that they had reason to believe Johnson may, in fact, have caused the ball to move. Officials said they would review the ruling with Johnson following his round. "As we looked at the video we had concerns," Jeff Hall, the USGA's managing director of Rules and Open Championships, said on-air during the Fox Sports broadcast. "It's only fair that we notify Dustin Johnson so that he can adjust his strategy accordingly, and give him an opportunity to see what we saw at the end of the round." Johnson had six more holes to play not knowing whether he would be assessed the one-stroke penalty. Johnson, for his part, told the officials he was convinced that he did not cause the ball to move.